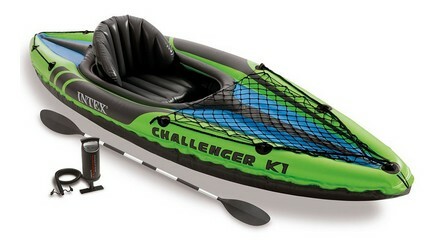 The Intex Challenger K1 Kayak is suited to any newcomers to the kayaking world. Whether traversing slow rivers, lakes or ponds, the K1 kayak can do the basics. Now we need to be clear, the Intex K1 is as basic a kayak as they come. It is also about as budget as a kayak can get. It’s aimed at those who just want some cheap aimless thrills on very flat waters. We’re going to be honest, the K1 won’t turn on a dime, and it won’t track particularly well. But if you want a cheap kayak to have some light-hearted fun, or maybe you want to introduce your kids to kayaking, then perhaps the K1 Challenger could be a good choice for you. Ok, now that we got the warnings out of the way, it’s time to look at what it’s got up its sleeve. The K1 is highly rated on merchant sites and is one of Intex’s best-sellers. When you buy a Challenger K1 Kayak, you are, in fact, purchasing a complete package. No need to buy oars or a pump separately. The kit comes with the Intex Double Quick High Output hand pump, a repair patch and an aluminum oar. Plus, you get to pick out either a green or grey/blue kayak. Intex have tried to boost your safety by maximizing visibility. With 2 colors to choose from and eye catching graphics on its exterior, it’s easier for other folks and vessels to be able to spot you. For those looking to pack a bit more than usual, cargo nets are available for storing of gear. For added comfort, there’s also an inflatable seat and backrest provided. Grab lines are present on both sides of the kayak. These perimeter lines help make it easier to grab the boat in the event of mishaps. The inflatable I-beam floors also serve to improve the product’s stability. Overall, the boat is relatively structurally safe, due to its welded material construction and streamlined design, it is suitable for leisurely pursuits on calm bodies of water. It has 2 air chambers, which help mitigate against a sinking disaster should you be unfortunate enough to get a puncture. The idea is that the remaining air chamber will keep you on the water long enough to get you to dry land. Wear a life-jacket (PFD) at all times, to improve safety. Additionally, Intex also ensures that its products comply with the safety standards set out by various governing entities. Each kayak undergoes rigorous testing and quality assurance tests. • Rudder is removable which is excellent for when the kayak is stored. However, it has a tendency to come off relatively easily when the kayak is in use. For a budget kayak, the appealing set of features it has is enough to convince new kayak adventurers to delve into the sport with this ‘easy on the wallet’ product. If you want to invest in something more serious, take a look at our kayak guide.